Newly released U.S. government Dietary Guidelines for Americans (DGA) reinforce the vital role of dairy foods in dietary recommendations. Released January 7, 2016, the updated Dietary Guidelines continue to confirm that three servings of low-fat and fat-free dairy foods each day provides an essential part of all healthy eating styles. 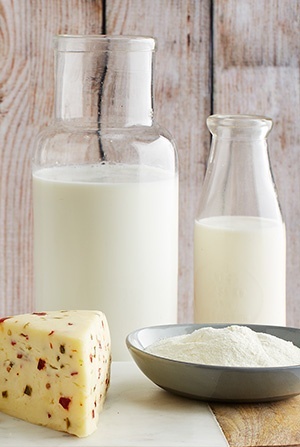 Tapping into dairy’s nutrition will continue to be integral for food and beverage formulators and foodservice operators to provide consumers with products that are not just good for them, but taste good too. The government updates the DGA every five years to help paint a picture for consumers to achieve a healthy diet. Dairy foods (e.g., low-fat and fat-free milk, cheese and yogurt) retain their important role in the DGA with even more reasons to consume three servings* every day. While people usually think about eating foods, not nutrients, the nutrients in our food choices matter to our health, and dairy foods help consumers meet nutrient recommendations for calcium, vitamin D and potassium – nutrients Americans are not getting enough of. Not only do dairy foods taste great, they are accessible, contain essential nutrients and come in a variety of options from lactose-free to low-fat or lower sodium — at a reasonable cost. Have kids? You can feel confident about helping children and adolescents eat the recommended amounts of dairy foods each day. Dairy foods are recommended to help meet calcium and vitamin D recommendations, and are linked with improved bone health in children and adolescents. In fact, milk is the No. 1 food source of nine essential nutrients in the diets of America’s children including calcium, vitamin D and potassium, three of the four nutrients the DGA notes children don’t get enough of. Eating patterns established in childhood often continue as they age. Parents can be a role model here too, eating a complete breakfast and drinking milk to help give their kids a head start to a lifetime of wellness. Build and enjoy a “healthy eating pattern” that includes dairy foods. The new U.S. guidelines propose three different healthy eating patterns: Healthy U.S-Style, Healthy Vegetarian and Healthy Mediterranean-Style and dairy foods are part of all three. The DGA notes “strong evidence shows that healthy eating patterns are associated with a reduced risk of cardiovascular disease (CVD). Moderate evidence indicates that healthy eating patterns also are associated with a reduced risk of type 2 diabetes, certain types of cancer… overweight, and obesity.” While there may be several ways to build a healthy diet, low-fat and fat-free dairy foods like milk, cheese and yogurt play an essential role due to their unique set of nutrients and contributions to health benefits, not to mention taste, satisfaction and enjoyment. Regardless of the selected path to a healthy diet, three daily servings of dairy foods like milk, cheese and yogurt can play an important role in dietary patterns and well-being, from childhood through adulthood. For more details, check out the National Dairy Council’s statement. For further background on dairy’s role in dietary recommendations in some other countries, visit here.